In the summer of 2013, an earthen dam on Three Mile Creek in the Millecoquins River Watershed failed, sending approximately 4,000 cubic yards of former impoundment and dam material downstream. GEI Staff conducted ecological impact assessments on a quarter mile of trout stream and approximately 5 miles of the Millecoquins River to its outlet into Lake Michigan. Over the course of one month, the GEI restoration crew moved 205 cubic yards of sediment by hand, and seeded, blanketed and planted newly exposed wetlands with more than 5,600 native species. Coniferous trees were harvested from uplands to build 10 unique habitat structures over 500 lineal feet. The expertise and implementation by the GEI team led to State regulatory approval two years ahead of schedule. This reduction in regulatory expenditures and design/build capacity saved the client thousands of dollars, allowing member funds to be used for additional worthwhile habitat conservation efforts. Samuel (Sam) Prentice, PE, is a Professional Engineer specializing in ecological restoration and design projects. 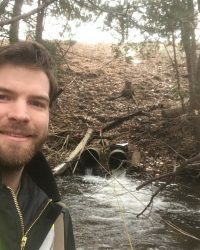 He has spent his career working across Michigan on various projects including road/stream crossing improvements, dam removals, streambank stabilization, recreation access enhancement, aquatic habitat structures, and stream relocation. He uses the engineering principles of hydraulics, hydrology and fluvial geomorphology to design projects that are compatible with the natural form and process of the surrounding ecosystem. Mr. Prentice enjoys working with a diverse set project stakeholders including municipalities, conservation groups, regulatory officials, and resource managers. Mr. Prentice attended Albion College where he received an undergraduate degree in physics prior to graduating from Michigan State University with a degree in biosystems engineering. Following graduation, he worked for Huron Pines in Gaylord as a project manager before joining GEI Consultants in 2015. When he isn’t working, he enjoys hiking and exploring around Marquette with his wife, Abby, and their dog, Maeve. 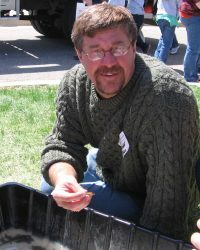 Stuart (Stu) Kogge is a Professional Wetland Scientist, Vice President and Senior Wetland/Aquatic Biologist for GEI Consultants of Michigan. Stu has a M.S. in Fisheries & Aquatic Biology and a B.S. in Fisheries and Wildlife Management, both from Michigan State University. He has over 33 years of natural resource and wetland experience having worked with various federal and state agencies, including the USFWS, MDNR, and MDEQ and wetland consulting and ecological restoration firms. He is currently stationed out of GEI’s Traverse City office but works throughout the Great Lakes Region. His expertise in working with regulatory agencies combined with his extensive knowledge of wetlands, aquatic, and plant communities, provides him with the unique ability to strategize and tackle complex projects and lead clients through even the most difficult regulatory processes/projects.